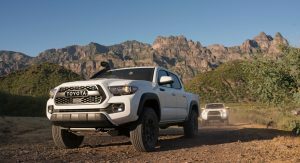 Toyota has officially revealed the updated range of its 2019 TRD Pro lineup, including the 4Runner, Tundra and Tacoma models. 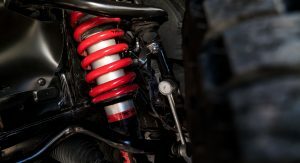 For the MY2019, all three members of the TRD Pro family return featuring all-new and bespoke 2.5-inch Fox Internal Bypass shocks, tuned specifically for each model. 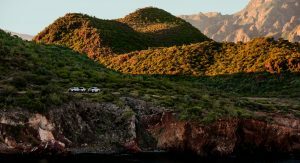 The new off-road Fox shock absorbers feature an aluminum body and 46mm pistons but instead of having an external bypass tube to fine-tune damping pressure, they incorporate multiple bypass zones inside of the shock. 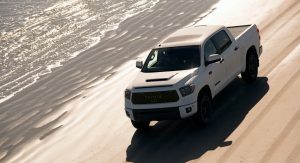 According to Toyota, the new shocks offer “a cushioned, plush ride during typical operation but get progressively stiffer through the shock stroke to provide excellent bottoming resistance”. 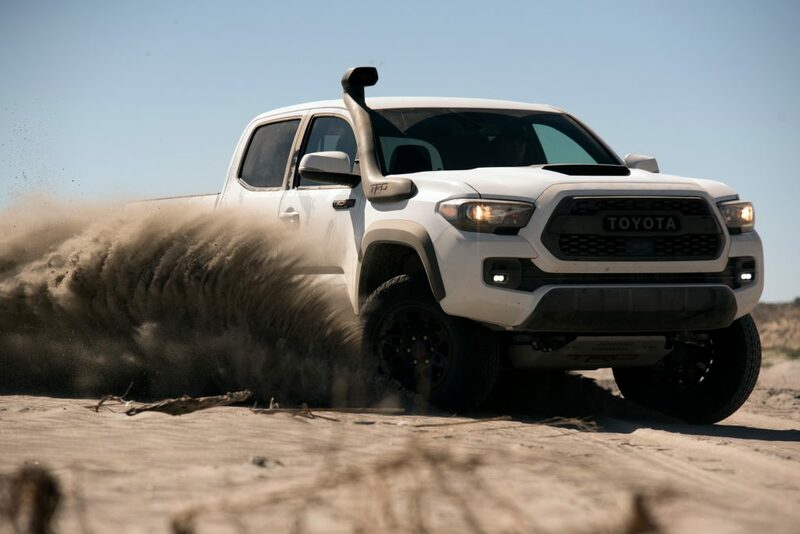 Front shocks are paired with specially-tuned TRD springs to optimize ride comfort and provide the necessary ground clearance. 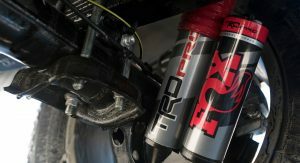 Each Fox shock combines fluid and nitrogen gas pressure, with a piggyback reservoir housing the additional oil volume. 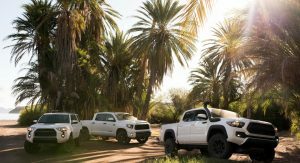 The rear setup depends on the model, with the Tundra getting the same beefy leaf springs that equip the TRD Off-Road version, the 4Runner utilizing TRD Off-Road coil springs and the Tacoma featuring progressive-rate off-road leaf springs. 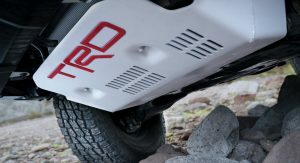 Added protection is provided by TRD’s dust boots front and rear keeping dust and dirt out, while the 4Runner features bespoke roost shields to protect its inverted rear shocks. 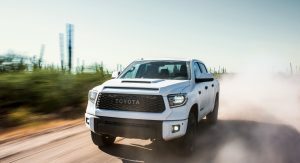 The new Toyota Tundra TRD Pro’s front Fox shocks feature 11 bypass zones (7 compression and 4 bypass), with the rear ones packing 12 bypass zones (8 compression, 4 bypass). 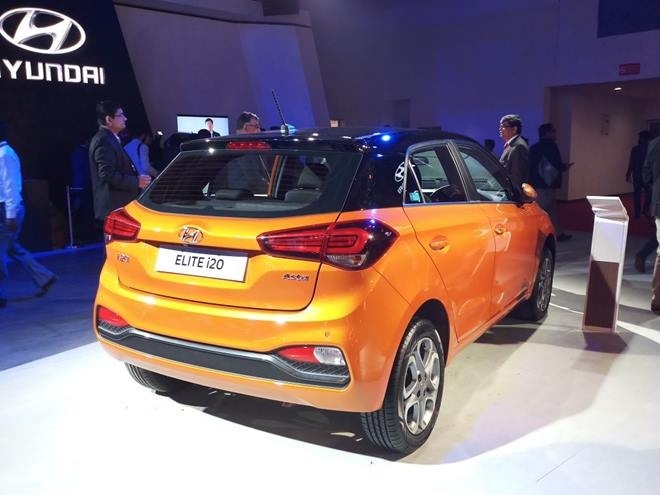 The front end is lifted by an additional 2 inches with the front wheel travel increased by more than 1.5 inches. 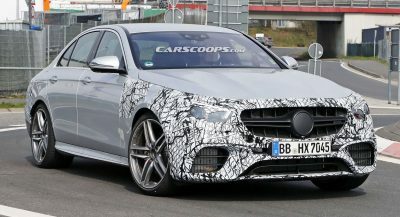 Rear wheel travel is similarly increased by over 2 inches. 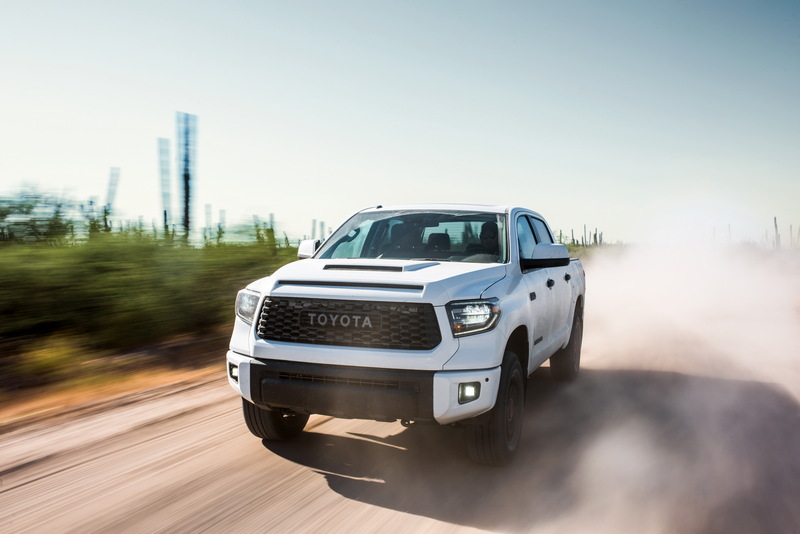 The souped-up Tundra also gets a set of 18-inch BBS forged aluminum lightweight wheels shod in Michelin P275/65R18 all-terrain tires. 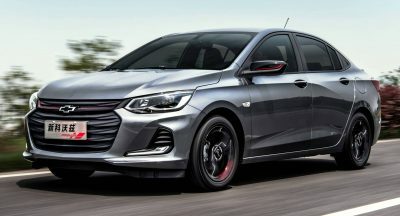 New LED fog lights from Rigid Industries along with black-themed LED headlights, new grille and a new hood scoop are just some of the exterior differences. 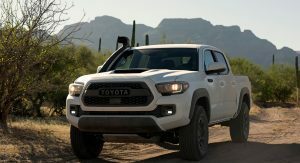 The new Tacoma TRD Pro’s front Fox shocks feature 8 bypass zones (5 compression, 3 rebound), with the rear ones having 11 bypass zones (7 compression, 4 rebound). 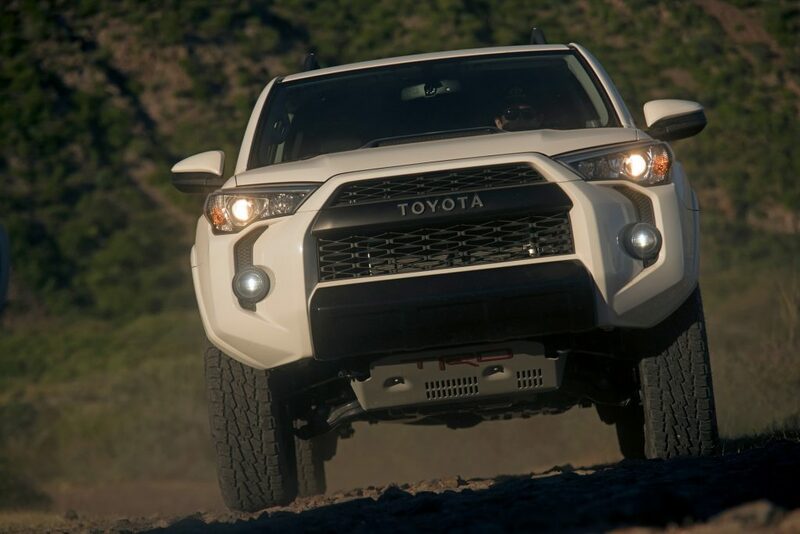 Thanks to the TRD springs, the front end gets an additional 1 inch of ground clearance. 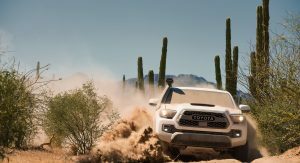 The tracks of the new Tacoma TRD Pro are also wider by 1 inch, thanks to the offset of the 16-inch TRD Pro black alloy wheels which are wrapped in P265/70R16 Goodyear Wrangler Kevlar All-Terrain tires. 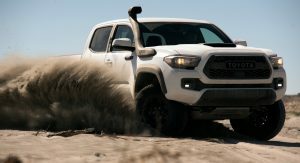 The off-road Tacoma is also the only one to receive a new TRD Desert Air Intake, which is designed to maintain consistent off-road performance, regardless of how silty or dirty the terrain gets as it’s located right above the windshield. 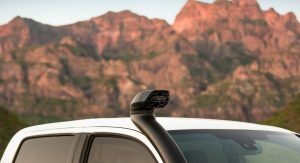 As for the new 4Runner TRD Pro, the iconic SUV features Fox shocks with 7 bypass zones (4 compression, 3 rebound) at the front and with 11 bypass zones (7 compression, 4 rebound) at the rear. 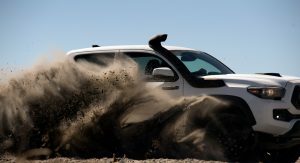 The front TRD springs provide an additional 1-inch of ground clearance and also provide nearly 1 inch of extra wheel travel. 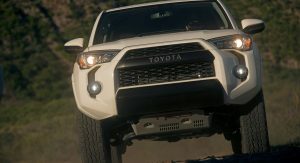 Other features of the 2019 4Runner TRD Pro include a new roof rack, a 1/4-inch-thick front skid plate and a set of 17-inch matte-black TRD alloy wheels with an offset change to widen the tracks front and rear by nearly 1 inch. 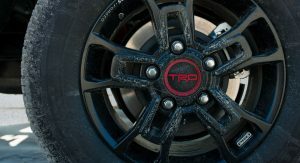 The alloys are also shod in Nitto Terra Grappler P265/70R17 A/T tires. 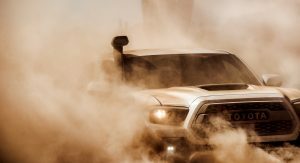 Toyota’s 2019 TRD Pro off-road trucks are making their public debut today, at the Chicago Auto Show. Just makes sure YOU FRICKEN UNDERCOAT THE TRUCKS SO THEIR SUSPENSION PARTS DONT SURFACE RUST PREMATURELY! 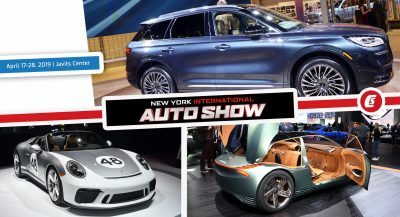 That’s you Mr. 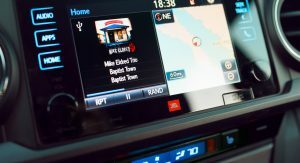 Toyota!! 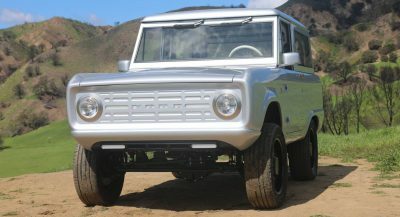 Why are most all pickups, mid- and full-size, almost always shown with 4 doors?